The present investigation aims to synthesize copper oxide nano rods using Asparagus racemosus roots extract (Ar–CuO) in an ecofriendly process. The synthesized CuO nano rods are characterized by XRD, SEM, TEM, FT-IR, Raman and UV–visible spectroscopy. X-ray diffraction pattern showed typical monoclinic structure. SEM and TEM analysis revealed the formation of self-assembled CuO nano rods with diameter and length ~ 50–100 nm and 400–500 nm respectively. The antimicrobial activity of green synthesized copper oxide nanorods was tested against various bacterial pathogens i.e., E. coli, B. subtilus, K. pneumonia, A. hydrophila, P. fluorescens, Y. ruckeri, F. branchiophilum and E. tarda with fascinating action towards harmful bacteria. Practicing greener pathway in nanotechnology usually inculcates utilization of natural sources, biodegradable and biocompatible materials, non-toxic solvents in a productive and cost effective manner [1, 2, 3, 4]. Green chemistry inspires to design new products and processes that cutback or eliminates the utilization and generation of hazardous substances [5, 6, 7, 8]. Nanotechnology has vast expansion in various fields involving the synthesis of nanoparticles, nanotubes and nanowires due to their surface-enhanced Raman scattering (SERS) and surface plasmon resonance (SPR). Metal oxide nanoparticles have widespread consideration because of their demand in the variety of fields including biomedical sciences, chemical industry, electronics, drug–gene delivery and biosensor etc. . Asparagus racemosus Willd belongs to the family Liliaceae, known as ‘Shatavari’. The major active constituents of Asparagus racemosus roots are steroidal saponins, isoflavones, asparagamine, racemosol, mucilage, polysaccharides, vitamins A, B1, B2, C, E, Mg, P, Ca, Fe, folic acid. It also contains many other chemical constituents that prevents ageing and impart immunity and vitality to the body . It is also used in nervous disorders, dyspepsia, tumors, inflammation, neuropathy and hepatopathy. Its medicinal uses have been reported in the I.P, B.P as well as in Indian traditional systems of medicine (Ayurveda, Unani, and Siddha). Various therapeutic uses have been reported in the literature for this plant. For instance, it is used as anti-ulcer, anti-tussive, anti-neoplastic, anti-stress anti-septic and anti-lithiatic activities. Further, the root extract is also used for immunomodulatory, hypoglycemic, hypolipidemic, antidiarrhoeal, antiseptic, bronchitis, hyperacidity, immunoadjuvant and wound healing activities [11, 12]. Asparagus racemosus Willd is being used in around 64 Ayurvedic formulations that include accustomed formulations such as ‘Shatavarikalpa’, ‘Phalaghrita’ and ‘Vishnu taila’. Recently, the extract of Aloe Vera plant has been successfully used to synthesize monoclinic phase with average particle size of 20 nm spherical nanoparticles with high yield by the reaction of aqueous metal source ions with the extract of the Aloe Vera plant . Though there are few reports on CuO nano particles using plant extracts [9, 14, 15, 16, 17, 18], to the best of our knowledge, there is no report on synthesis of CuO rod like nanomaterials using A. racemosus root extract. It is well known that nano structured materials have enhanced antibacterial activity due to their high surface area. In the present work, we studied the synthesis of CuO nano rods using A. racemosus root extract for the first time and evaluated the antibacterial activity against various bacterial pathogens. In the present study, we choose fish bacterial pathogens along with human bacterial pathogens as the Aqua culture and fish farming sector growing tremendously from the last decade. However, the major risk in this sector was bacterial infections. In addition, usage of antibiotics is most common in the aquaculture industry, which leads to development of drug resistance along with accumulation of these drugs in fish. Finally, fishes can spread the antibiotics or drug resistance bacteria or infections to human who consumes them, which leads to serious health problems. Therefore, the alternate antibiotic for human as well as fish bacterial pathogens is mandatory. Asparagus racemosus plants were collected from Andhra university campus, the roots were separated from the plants, washed under running tap water and shade dried at room temperature. Dried roots were powdered using mixer grinder, mechanically sieved and subjected to soxhlet extraction using deionized water for 24 h. The aqueous solution obtained after extraction is subjected to concentration under reduced pressure by rotary evaporator, after it is dried in hot air oven at 50–60 °C. The crude extract was stored at 4 °C until use. In order to synthesize CuO nano rods, we have chosen green combustion method with root extract as a fuel. A. racemosus aqueous extract powder (500 mg) was dissolved in 100 mL of distilled water. Copper nitrate (1 M) was first dissolved in 100 mL plant extract solution and poured into RB flask under reflection and stirred at 60 °C for 8 h followed by cooling to room temperature and the supernatant was discarded. The black solid product obtained was centrifuged twice at 3500 rpm for 20 min (using Beckman centrifuge with a Beckman JA-17 rotor), and thoroughly washed to remove all the ions. Further, the synthesized CuO was heated in a Rapid Thermal Annealing (RTA) system at 200 °C for 3 h under nitrogen (N2) and oxygen (O2) flow at ambient atmosphere. The resulting dried precursor was crushed into powder and stored in airtight container for further analysis. The optical property of copper oxide nano rods were analyzed with UV–Vis Spectrometer in the range between 240 and 800 nm. The phase identity and purity were identified with X-Ray Diffraction (PANAnalytical—XPERT-PRO). Functional group and chemical composition analysis has been done using FTIR (Shimadzu Prestige 21) spectrometer. Raman spectroscopy was performed using (Horiba HR 8000, Excitation wavelength: 514.5 nm). The shape and morphology of the CuO nano rods were explored by scanning electron microscopy (SEM-Hitachi s-4200N), and energy dispersive X-ray analysis (EDAX) and elemental analysis was done using the same instrument. For further size and crystallinity, TEM, HRTEM images and SAED pattern was done using transmission electron microscope (TEM-1200EX, JEOL Ltd.). The antibacterial activity of CuO nano rod like structures was tested against bacterial pathogens using well diffusion method . The test organisms selected include both gram positive bacteria i.e. Bacillus subtilis, Staphylococcus aureus and gram negative bacteria i.e. Escherichia coli, Klebsiella pneumonia, Aeromonas hydrophila, Pseudomonas fluorescence, Flavobacterium branchiophilum, Edwardsiella tarda and Yersinia rukeri. The microbes were cultured in nutrient broth. A 100-Microliter (μL) solution of broth microbial culture was prepared which was then blown out on Muller Hinton agar plates. The plates were left undisturbed for about 10 min to enhance culture absorption. With a sterile gel puncher, the wells (6 mm size) were pierced into the agar. Using a micropipette, a 100-μL solution (50 μg/mL) of CuO nano rods and the positive control gentamycin has been used. The incubation was carried out at a temperature of 37 °C for about 24 h. The size of the inhibition zone was quantified. The same analysis was repeated for three times. The results of the mean and standard error of the mean were presented. The UV–visible spectrum reveals a strong absorbance near 275 nm and 660 nm suggesting the formation of copper oxide nano rods (Fig. 1a). 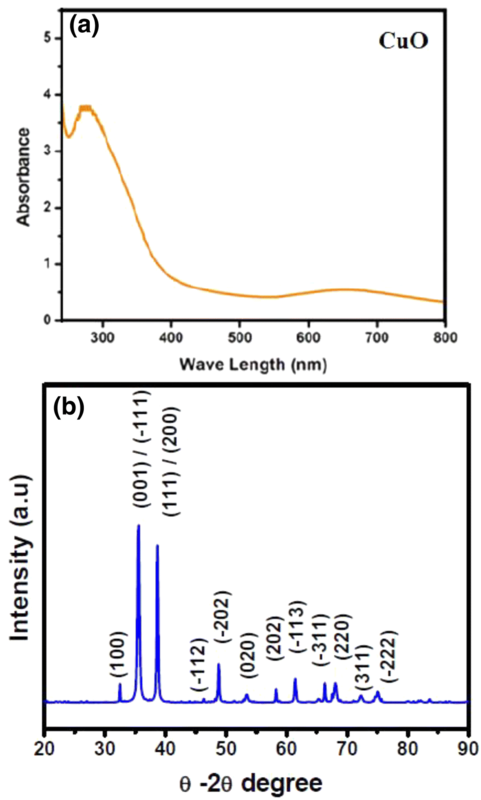 The UV–visible spectral analysis displayed a surface Plasmon peak around 270 nm and 670 nm, which indicates the emergence of CuO nano materials, which is similar to previous reports [9, 14, 15, 16, 17, 18]. The incidence of the SPR absorption reflects the shape and size of the nano materials. 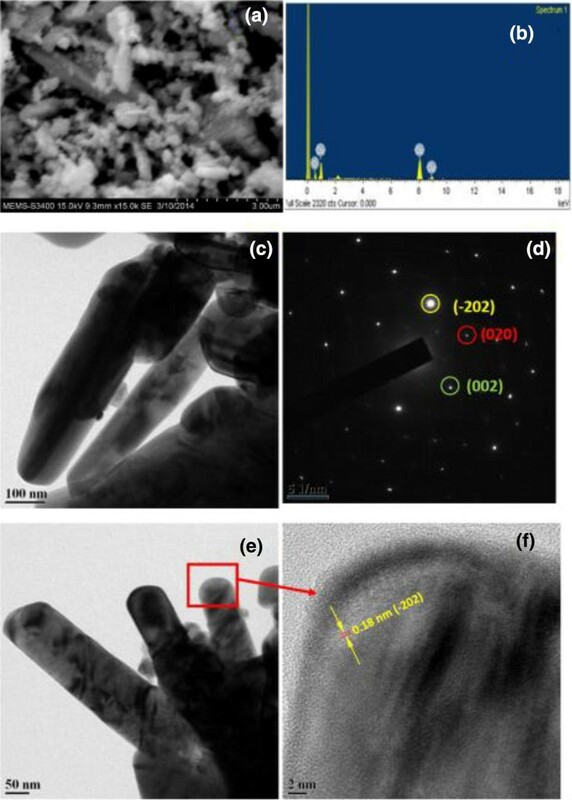 The crystalline nature and structure of copper oxide nano rods synthesized from A. racemosus (Ar–CuO) has been examined by XRD patterns and is shown in Fig. 1b. XRD analysis displayed intense peaks corresponding to (110), (111), (200), (202), (020), (202), (113), (311), (220) and (400) planes which is in good agreement with JCPDS card of CuO (JCPDS 05-0661). All the diffraction peaks can be catalogued as the typical monoclinic structure and no extra diffraction peaks of other phases are noticed. The XRD pattern revealed the highly crystalline nature with high purity. 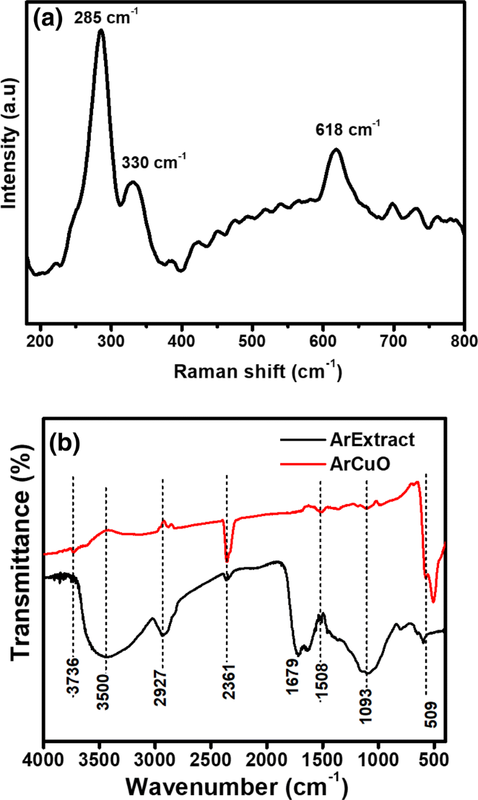 For further confirmation of structural properties of Ar–CuO nano rods, Raman spectra have been recorded which is depicted in Fig. 2a. From Raman spectra, three Raman active modes were observed at 285, 330 and 618 cm−1. The sharp peak at 285 cm−1 ascribed to A1g vibrations, whereas a shoulder peak at 330 cm−1 is related to B1g vibrations. A broad peak of lower intensity at 627.9 cm−1 can be attributed to B2g phonon modes. The results are in good agreement with those of reported literature, which indicates that the as prepared product consists of single-phase CuO with a monoclinic structure [14, 15]. FTIR analysis (Fig. 2b) of green synthesized CuO nano rods using A. racemosus (Ar CuO) root extract depicts strong band peaks at 509 cm−1 that correspond to the stretching vibration of metal oxide i.e., Cu–O bond in monoclinic phase of CuO . The absorption peak at 3743 cm−1 could be attributed to the stretching vibration of (–OH) adsorbed water (H2O) molecules and surface hydroxyl groups related to the phenolic compounds. The frequency bands at 1508 cm−1 can be related to amide-I band from carbohydrates and/or saponins . The amide-I band appears due to carboxyl stretch and N–H deformation vibrations in the amide linkages of the proteins present in it. The IR bands observed at 1348 cm−1 could be related to the characteristic peak of –C–O–C– and –C–O– groups from carbohydrates . The absorption peaks at 1472 cm−1 may be related to the stretching vibrations of carboxylate (COO) group and amine groups [14, 15, 16, 17, 18]. These results confirm that the phytochemicals were present in aqueous extracts of A. racemosus plant. These results explain that the plant extract material played a role of reducing as well as stabilizing and or capping agent for the synthesis of CuO nano rods. The morphological and chemical composition analysis has been studied using SEM–EDX analysis of CuO nano rods using A. racemosus (Ar–CuO) which was provided in Fig. 3a, b. The morphology of Ar–CuO nanomaterials analyzed by SEM analysis exhibited nano rod like morphology. For further analysis of structure, size and crystallinity of rod shaped morphology, we have examined TEM and HRTEM analysis. TEM and HRTEM images revealed CuO nano rods with diameter around 50–100 nm with length of 400–500 nm (Fig. 3c, d). The SAED pattern (Fig. 3e) of synthesized CuO nano rods depicts the monoclinic structure of CuO and is in resemblance with the XRD pattern. The interplanar spacing between two adjacent lattice planes obtained from HRTEM image (Fig. 3f) is 0.18 nm which corresponds to (− 202) lattice plane of CuO monoclinic structure. The formation mechanism of green synthesized CuO nano rods without using any additives or surfactants in the presence of aqueous extract of A. racemosus plant solution has been discussed below. The heat release due to addition of plant extract solution can be utilized to enhance the crystal growth. In addition, the presence of phytochemicals with C=O and COO compounds in the plant extract also play a part of role in mechanism. It is speculated that C=O can act as bio-template agent, as well as carboxylate groups favors the directional growth for transformation into CuO nano structures under rapid heat treatment of agglomerated Cu nano rods after centrifugation process . In detail, when copper metal salt was added to plant extract solution, the Cu2+ ions are released from copper nitrate solution due to reduction process using plant extract. The Cu2+ ions react with N–H and –OH compounds, which leads to the formation of metastable state i.e. ; Cu(OH)2. Further, the transformation into CuO nano rods from meta stable Cu(OH)2 during biosynthesis process can be explained by considering the role of C=O, and COO groups at 60 °C for 8 h under continuous stirring and by further rapid heat treatment under nitrogen and oxygen gas flow at ambient conditions . The anti-bacterial activity of green synthesized copper oxide nano rods has been evaluated against various bacterial pathogens. The copper oxide nano rods synthesized using root extract of A. racemosus exhibited effective antibacterial activity against tested bacterial pathogens. The Minimum Inhibitory Concentration (MIC) of CuO nano rods was 6.25 μg/mL for both gram-negative and gram-positive bacteria (data not shown). The zone of inhibition of CuO nano rods with 50 μg/mL concentration was found to be highest for B. subtilus (23.00 ± 0.63), followed by S. aureus (21.83 ± 0.75), K. pneumonia (20.00 ± 0.63), E. coli (19.83 ± 0.75), A. hydrophila (19.00 ± 0.63), P. fluorescens, (18.83 ± 0.75), Y. ruckeri, (18.67 ± 0.82) F. branchiophilum (18.17 ± 0.75) and E. tarda (17.95 ± 0.46). Compared with antibiotic gentamycin the copper nano rods structures showed more activity and susceptibility against both gram-negative and gram-positive bacteria (Fig. 4a, b). From these observations, it is clear that Ar–CuO nano rods structures showed enhanced activity when compared to gentamycin and CuO nanoparticles as reported from our previous study and reported literature [13, 16, 17, 21]. The higher antibacterial activity of Ar–CuO nano rods might be due to the high surface area of CuO rod structures. 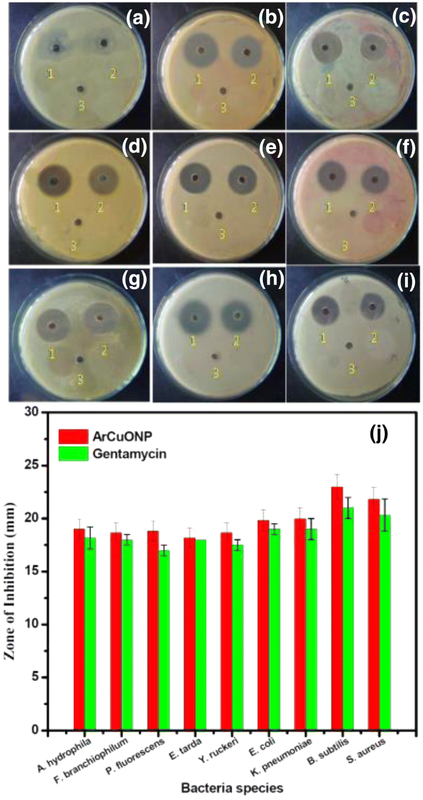 Antibacterial activity of green synthesized CuO nano rods (4.8 ± 1.6 nm) of gum karaya, showed 16.2 ± 0.8 mm and 14.5 ± 0.6 zones of inhibition values against Escherichia coli and Staphyloccus aureus respectively . In comparison to these results, the zone of inhibition of CuO rods structures using A. racemosus plant extract against Escherichia coli and Staphyloccus aureus were 19.83 ± 0.63 and 21.83 ± 0.75 respectively. The enhanced antibacterial activity of all bacterial pathogens against Ar–CuO nano rods might be attributed from large surface area obtained via nano structures, which provides better contact with microorganisms. The released copper ions may subsequently bind with DNA molecules that leads to helical structure disorder by inter and intra linking nucleic acid strands. Moreover, copper ions intracellularly obstruct biochemical processes . The exact mechanism behind the effect is not known and needs to be studied further. Furthermore, the Gram-negative bacteria seemed to be more resistant to CuO rods than Gram-positive bacteria. This observation is in agreement with earlier studies , where it was earlier reported that the interaction between gram-positive bacteria and nanomaterials was stronger than that of gram-negative bacteria because of the difference in their cell wall structure. Apart from surface potential and metal ion release mechanisms from various kinds of nano materials, generation of ROS (reactive oxygen species (superoxide radical (O2−), the hydroxyl radical (·OH), hydrogen peroxide (H2O2), and singlet oxygen (O2))) could play significant role to inhibit the bacterial growth. Among various metallic and metal oxide NPs, CuO nano materials have specific advantage to have enhanced antibacterial activity. From recent reports, the enhanced antibacterial activity might be attributed from generation of all four types of reactive oxygen species and was the possible and proposed mechanism especially in case of CuO nano materials. Furthermore, nano structured CuO could exhibit predominant antibacterial activity due to high surface area. A facile, unhazardous and green method has been developed to synthesize copper oxide nano rod structures by using root extract of A. racemosus as both reducing and stabilizing agents. The green synthesized CuO nano rods are well characterized using UV–Vis spectra, XRD, SEM, TEM and FTIR analysis. The green synthesized CuO nano rods exhibited potential biological activity against selected human pathogens and fish bacterial pathogens that might be attributed from large surface area of CuO nano rods. We are thankful to the DST-PURSE Programme (No. SR/PURSE Phase 2/14 dated 22-09-2014) for the financial assistance and Advanced Analytical Laboratory, Andhra University for their support in carrying out in this research work regarding SEM–EDX and XRD, FTIR and UV spectrum analysis. Research does not involving human participants and/or animals.